Think it's just us with MRIP catch-estimate troubles? Now ALL of the Gulf States have banded together to eject MRIP from their red snapper management. Far from a slam dunk, its a dern-site more than one partyboat skipper's clients punching the keyboard..
Federal managers set fishing seasons using imprecise estimates of recreational red snapper landings from the Marine Recreational Information Program (MRIP). Using these faulty data, they inaccurately estimate fishing quotas and are forced to set overly restrictive seasons. These are STATES! Not just anglers.. Boy do those red snapper woes have a familiar feel.. There are 435 members in the House of Representatives & 100 Senators. The more of them that say, "Oh Yeah, I heard about MRIP from some angry constituents," the more likely we are to slay this beast.. It's bigger than ever. Boats are in trouble from Maine to Texas--not because of fish, but because of bad data. The only way to kill MRIP is death by 20,000 letters..
Skunks are always possible while tog fishing. Really. It's a frequent occurrence, even with a good bite. Not an easy fishery; the very best toggers sometimes get their head handed to them despite folks all around having done well. Then too, sometimes the whole boat can do very poorly. If you can't take the heat, and there ain't much of that either, stay out of the kitchen. But If That Sounds Like Your Kind Of Fishing, Good! Cause We're Going Toggin Anyway! Tog Only, Sea Bass Closed. (still) Have (some) live White Crabs For Sale AT THE DOCK for the low, low price of just $5.00 per generous exact dozen. (they're small & most have died) There Is No Guarantee We'll Have Whites For Any Trip. Sometimes they all die. That shrinkage is why I prefer greens. We will not be bringing whites with us in the ocean. Green Crabs Remain Provided As Boat Bait And Are Included. A tad warmer now despite recent snow; the ocean, however, has only grown colder as ice melts in our bays & estuaries. To catch a tog right now I must take a very long ride - very. Even that may not work! In three more weeks we'll see nearshore waters warm & the traditional tog bite begin. This trip is not that - not at all. In fact, this particular trip is as opposite as possible. Here I intend to make a CRAZY long run..
Reservations Required for All Trips. Reservations at 410 - 520 - 2076 — They Answer 24/7. LEAVE YOUR BEST POSSIBLE CONTACT NUMBER - Weather Cancelations Are Common - I Make Every Attempt To Let Clients Sleep In If The Weather's Not Going Our Way..
We provide green crabs. You're welcome to bring any kind of crab you like – even lobster, even plastic. If You Book — BE SURE TO LEAVE A GOOD CONTACT NUMBER & DON'T TURN YOUR PHONE OFF! Agreed With Or Not, All Regulations Observed – Maryland: 4 Tog @ 16 Inches – Sea Bass Closed On Jan 1st Because Of Rotten MRIP Catch Estimates. If You Won't Measure & Count Your Fish The State Will Provide A Man With A Gun To Do It For You. We Measure & Count — ALWAYS — No Exceptions! It's Still Winter Out There!! Wear Boots, Not Sneakers! Fingerless Wool Or Thin Fleece-Lined Waterproof Gloves With Handwarmers Tucked Into The Palms Make For A Comfortable Day..
Dramamine Is Cheap Insurance! Crystalized Ginger Works Great Too. It's Simple To Prevent Motion Sickness, Difficult To Cure. Bring A (not terribly big) Fish Cooler With ICE (or fresh snow) For Your Party.. A 48 QT Cooler Is Good For 2 Guys. Even Now You Should ICE Fresh Fish..
Be A Half Hour Early - We Like To Leave Early. Clients Arriving Late Will See The West End Of An East Bound Boat.. Very Good Things Are Happening With OCRF Reef Building. Our Largest Concrete Project Ever Has Begun. We're rolling trucks - stockpiling precast concrete for April deployments. Here's the first three loads. We have funding for approximately 80..
Know anyone with a BIG forklift to lend? Now 10,994 Reef Blocks by the stern rail – 2,146 at Doug Ake's – 1,218 at Saint Ann's – 558 at Eagle Scout Reef - 557 at Lindsey's Isle of Wight Reef and 322 at the Brian Sauerzopf Memorial Reef..
Our Reef Block pile was reloaded with monster 90 pound blocks courtesy of Potomac Valley Brick, Inc. of Salisbury. 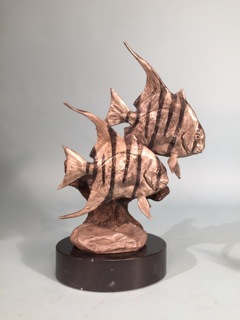 New 2015 OCRF Reef Raffle for a bronze Turner Sculpture of a pair of spadefish. About 16 inches high, it's an awesome piece. Maybe I'll keep it in my office this summer for safe-keeping.. Send an email w/your address and I'll snail-mail you some tickets. Just return the stubs & money. We'll pull a winner Thanksgiving week. Oh man it felt good to be at sea again. Been taking care of a family issue, it's now resolved quite well. Will try to fish more as conditions allow in this very brutal winter somehow rumored to have already become spring. Only had a tiny handful of guys last Wednesday. Tied her loose at 5am in slick-calm conditions. At about 7am I saw something floating on the surface. Didn't look normal. Was not a tree trunk or piling, not a piece of trash. Slowed to have a look; the huge seal lifted it's head and snorted. I could plainly see its exhalation ripple across the water before it departed for the deep. Last time I saw a seal at sea was back in the late 1990s. A favorite client shouted, "Look! There's a dog!" Well, their head does look sort of dog-like. That particular one was about 12 miles out. Wednesday's sighting occurred before we were halfway out. Later we saw an enormous fin whale. I opened my 2/22/15 Fish Report with, "I anticipate the next fish over my rail will be a cod." And so it was. Although a pretty cod of maybe 25 inches was first; the next 8 or 10 were sea bass in the 2 to 4 pound range. Thanks to MRIP & "We just don't know!" arm-waving at NOAA & Council, those sea bass had to go back. Sea bass were open in winter a couple years back, in 2013. They were open year round almost the entire time as we were witnessing their greatest population growth ever recorded - and most of that w/o even a bag limit let alone any closed season. With so much "We just don't know!" expressed by management during that 2013 winter period, a couple of us put in a lot of time & effort in to deliver a near-perfect over-estimate of sea bass caught during that post-Sandy winter opening. Yeah no. While some in management certainly believed our work, believed we had a very close approximation of sea bass landed in that Jan/Feb period, they could not officially 'accept' it. Everywhere ignorance clouds judgement, poor result follows. The estimate we gave MAFMC was far closer to perfect than anything MRIP or MRFSS ever did. We know what we caught..
Management's comfort, however, (with paychecks hovering above a shredder) is found only on computer screens in familiar format. MRIP's the data they're allowed to use. Because MRIP does not generate a winter estimate for any species above Hatteras: "We just don't know!" Truth cast aside to embrace the impossible; many fisheries from Maine to Texas are being destroyed with estimates no one in management has confidence in - but are forced to use. A few more sea bass went back & then a thumper; that head shaking bulldog fight that only comes from one species in our region, a fish Bully Bob calls "DelMarVa Grouper" --old chiseltooth himself-- a nice tog of perhaps 11 or 12 pounds. For some reason everyone on the back of the boat then shifted to the port side..
Ended the day with dinners around. Just one fellow limited; there were a few more cod too. Would have been wonderful to keep a few of those sea bass. I'd have also been glad to keep my ocean pout eel which I instead duly released. A friend up north tells me the reason they're on the 'no take' list, the reason they're Closed, is because they might be confused with wolffish. No less an authority than Dr. Gary Shepherd recently confused a bergall with a tautog in a demonstration at an educational seminar. Then too perhaps a narwhale might be confused with a swordfish, or a black bellied rosefish confused with a red snapper. Shoot, MRIP estimates get confused with facts all the time. Confusion abounds in our fisheries! Truthfully, I have never-ever heard of a wolffish in this part of the world. Perhaps management's grave concern over our confusion is misplaced.. Apparently ocean pout have been closed for a few years now. I follow along pretty close, yet I was never offered the chance to participate in a public meeting nor invited to comment on the fishery management plan for ocean pout nor was any catch data - right or wrong - ever shown. Let's see if we can back up the clock here. I'll ask MAFMC why we're denied access to this itty-bitty bycatch fishery. Old Capt. Harry would roll-over in his grave if he knew his "Piled High Fish Sandwich" was banned. He used to buy pout cheap from trap fishers and deep fry 'em - very tasty - and profitable..
A handful of people out on a beautiful day; the fishing was taking care of itself. I thought about the structure we were over. It's pretty close to 10 miles from anything else that I'm aware of and not very big at all. I was on this piece a few years ago, also on a tog trip, and couldn't find the wreckage. There were so many sea bass around I couldn't paint the structure. Close is never good enough for tog. Finally the swarm of cbass parted and I was able to throw a pair of anchors so my tog fishers could drop precisely into the structure. I've also seen sea bass on this piece in the heart of summer. Any tog are certainly resident. Who could guess how these reef fish find structure in the middle of such vastness. You can bet your last dollar there are awesome lobster there and, of course, ocean pout as well. Three of four species mentioned here are managed. One's just closed w/o managerial process because NOAA wanted to. With our seafloor all sand & mud in the literature, why is it so important that my anchors are in exactly the right spot? For further than I could see in any direction, there was no other habitat for these 3 managed species and one closed over confusion. Over a hundred square miles of ocean, well over; and no other habitat.. Besides OCRF work, I also chair the Maryland Artificial Reef Committee for MD DNR. We've been doing a low-budget -but scientifically sound- volunteer study of reef angling effort in the Chesapeake. No one would volunteer to spend two hours anchored over sand. If we want to do that part of the study we'll have to pay biologists..
Granted, some of our volunteers are college educated. But I don't think any have degrees in biology or fisheries.. How come they know they do not want to fish barren bottom, but the folks who do have fisheries/biology degrees haven't brought habitat into management, haven't brought habitat into the fight for restoration? Regardless of my entire argument for historical reef loss & need of its replacement to truly restore fisheries; it's just plain as day we can 'make fish' by building artificial reef. Actually, it's the fish that make more fish. We just make suitable habitat for Feeding, Spawning & Growth to Maturity. Funny. Those exact words are found in the very same law that "forces" managers to use MRIP's estimates no matter how horrid their stench. Magnuson is also quite clear about Essential Fish Habitat. It's perfectly obvious from my vantage and from a lot of the science that increased habitat can easily be parlayed into greater fish populations. Who could argue, "No! It's easier to rebuild fish if we take away habitat!" or "Blow that oyster reef up! It concentrates striped bass for easier harvest!" Yet that's virtually what the very top of NOAA does when they proclaim, "Well, we still have questions about whether artificial reef just attracts fish or produces them." That's the 'Attraction vs Production Debate'.. In stymies & stifles all marine habitat construction. When sea bass & tautog - ocean pout too - spawn at that ultra-isolated piece of habitat later this spring, the 'production' of that accidental artificial reef will not have been 'attraction.' Production will be in fertilized eggs that must now also feed, grow to maturity, & spawn. "Wow man. It's like some kind of cycle, dude." Eventually fishing pressure & spawning age will be used to refine calculations of habitat production. Habitat's primary measure will be cubic measure. A very flat natural or artificial reef will have nowhere near the production of a natural or artificial reef with substantial rugosity. Reef with nooks & crannies of all sizes reaching high up into the water column is incredibly more productive than, say, one layer of exposed cobble. In my life experience & from tagging I believe habitat 'attraction' occurs when fish are in the first year of life. Theirs is a brutal world; juveniles of any reef species either get attracted to good habitat or die trying. Production occurs on all these artificial, natural or accidental habitats in equal measure. Reef rugosity & footprint is the greatest determining factor. When anchored over a lonely reef--far, far from any other; the plainest idea of habitat can become concrete. With barren seafloor as far as the eye can see in any direction, it's plain that management's abject failure to connect habitat with fishery production leaves among their greatest strengths unused. Fortunately for us, it's the Army Corps of Engineers who write artificial reef permits. 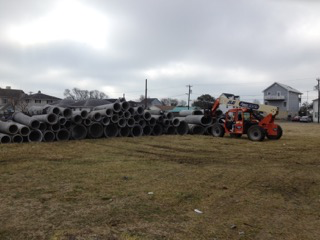 We already have a big pile of miscast concrete pipe for this spring's deployments. Our 'big pile' is really just three and a half trucks; the very, very beginning of about 80 truckloads the Ocean City Reef Foundation intends to take offshore in the coming month. We'll start Capt. Bob Gowar's Reef at the Bass Grounds, and we'll make the Brian Sauerzopf Memorial Reef Group a sweet destination. I'm hopeful we can finish Ake's Reef at Russell's too, but that depends on a renewed permit wending its way through process. I'm sure we'll get several truckloads of concrete and a whole new load of Parkside High's welding class reef units deployed at Kelly's Reef just south of the inlet. We'll also expand the Lindsey Power Reef 6 miles NE of OC; and, just a shade north of that, begin what will become one of our best reefs ever: Sue Foster's Reef. Will go as big as we can. Management can catch up or not. Please do two things: Write letters--right now--to Congress & the Secretary of Commerce about what you think of NOAA's fancy-pants MRIP catch estimates. Hand write if at all possible. A stamped letter is a powerful tool. Any letter is a better tool than no letter. And, if the winter hasn't been too unkind, make a donation to the Ocean City Reef Foundation http://www.ocreefs.org ..
We'll be spent-out in a month. Completely. If we raise another 30K before then, it'll just be that much more reef this spring. No salaries. No fancy steak dinner meetings. Everything is 100% spent on fundraising & reef building. Will send our spring funding appeal to sponsors as soon as we have pictures of concrete being loaded on the 103 x 30 foot Iron Lady we have chartered for April. Many readers will remember the Wendy's commercial "Where's the Beef" from the early 1980s. We'll show OCRF sponsors 'the concrete' before we spend big money on a mailer. We'll soon, very soon, have that beef..
Below is a letter I sent to Ocean Policy folks. Seems to be getting legs. If we begin sea bass season with cut-MRIP for bait, we'll be fantastically closer to finding a true path for restoring fisheries. However, MRIP only needs a couple more estimates to serve us at management's annual banquet instead. ..I did watch the film <http://ocean-frontiers.org/of2> and knew many of the players in it. I do think ocean planning's vital to turning a very bad result of recent decades around. Our part of the Atlantic - Right Here - has soured far more swiftly than anywhere else in the US. I think that's because the world's most powerful current shoots offshore at Hatteras and creates a dam..
Dr. Jon Hare showed how satellite imagery reveals the ocean is a meter higher on the north side of the Gulf Current as it turns offshore. It is my belief that because the far weaker inshore & southerly-flowing Labrador Current is damed, backs-up against the more powerful force of the Gulf; our estuarine outflows loaded with nutrients become locked-in just off our coast. Two of the worlds largest estuaries flow into this 'reservoir' behind the Gulf's dam. Both are exquisitely well documented to be below 1% of their original oyster habitat. One could say both have had a complete failure of their bio-filtering capability. Where men once captured marlin--targeted marlin, just 5 miles out; now they must often go at least 60 miles. Bluewater fish cannot feed in green water. A history of marlin fishing's core activity is also a history of our greening sea. Then too, the corals just off our shores that I've been trying to get documented as Essential Fish Habitat since 2001--those corals in 60 to 135 feet (not fathoms) of water growing on our remaining natural hard-bottoms; I believe they too are utterly dependent on sunlight. There was never-ever EVER any forward motion on discovery of these corals until Marine Spatial Planning was begun - Especially By The Good Folks At The Nature Conservancy. The idea that our marine 'squirrels' may be in need of 'trees' - that reef-fish might require reef before true fisheries restoration can take place, has yet to penetrate NOAA. NOAA is, I'm quite happy to report, now taking our offshore corals very seriously. As is often the case with things in government, there's an arbitrary line at 600 feet - 100 fathoms - inside which no concern has yet been shown. I believe we have a wonderful deep-water reef ecology in 50 fathoms. I also believe at least one 50 fathom reef near the Washington Canyon should be a considered a National Treasure.. NOAA's coral researchers, for the moment, remain uninterested - or at least unfunded. Then too I sense you're strongly opposed to offshore oil. I'm guessing you're unaware of how much oil is shipped & 'lightered' from offshore. With no exaggeration, we have the largest oil tankers in the world coming to within 30 miles of our coast. Remember that little spill up in DE Bay a few years back where a ship's hull was punctured? The response was pathetic.. Tomorrow we could have a spill several orders of magnitude greater with a correspondingly less effective response. With an all-to-common NE wind, it could, literally, close ALL our beaches for ALL of 2015. We have one (1) small oil response ship stationed in the C&D & a fleet of tiny zodiacs.. Personally, I would welcome drilling if it caused greater protection from spill. Do not think we truly have a grip on anything in our part of the sea. Surely you'd think you can look up how many fish we catch - and surely you'd be amazingly misled. Maryland, for instance, is estimated to have caught 348 sea bass in 2014. That's what everyone in MD caught all year. Yet I carried folks from MARCO and NOAA on Veterans Day when we caught a number of fish approaching what NOAA claims MD caught all year. People in my line of work (Partyboat fishing) have to report our catch on forms filled out daily. If we do not, we will certainly not see our permits renewed. Even with that daily reporting, and my boat catches sea bass nearly every day; my industry is said to have caught zero sea bass in 2014. Much more damaging, there are repeated assertions of recreational fishers going over-quota based from these estimates. Private Boats from Massachusetts or NY or NJ are said, every year, to catch more sea bass in a few weeks than ALL Party/Charter catch ALL YEAR. There's even a 2010 estimate where guys sitting on buckets along NJ's jetties caught more tautog in March/April than the entire US Commercial Fleet caught ALL YEAR. These estimates are forced upon Fishery Regulators at Council & Commission as though handed down by Moses himself. They are considered perfect & pure as regulatory inputs despite having virtually no one's confidence. If you ask Joe Biden how many sea bass Maryland caught last year, he'll tell you 348. The pretty little PSE (like margin of error) takes the estimate up to about 800. Our Vice-President would still be much-more than an order of magnitude off, but at least he'd have a number that everyone in the regulatory community holds sacred. . . .
One day back in the 1990s (and I can find out precisely what day) a school of croaker I was fishing on moved up to the "Free Reef." This reef is the armor-stone that covers OC's sewer outfall. A hot Saturday afternoon in August; apparently our sewer treatment plant could not keep up. I got out of there fast, but can still picture that filth as though it were yesterday. We have no idea our ocean's turned green. We have no protection from trash or oil spills. While we do have assurances of sewer treatment; they're not always true. We have no recognition of nearshore reefs - the largest area of which in our region lie just off the Delaware Coast. We have no idea of reefs in square-mile measure that were lost in the heart of the industrial fishing era & therefore no possibility of creating a reef restoration plan. We have no idea our ability to grow fish & coral on concrete & boulder substrates easily sited with heavy equipment; no idea the power of artificial reef. Although NOAA does seem to have a reasonable grasp of 'how many fish are in the sea' - a huge undertaking to be sure - they have, literally, no idea what recreational fishers actually catch. I can assure you someone decided in 2003 that they would always over-estimate to be safe. Now recreational catch estimates are killing my industry from Maine to Texas. My business is in grave danger of regulatory extinction over something that's not at all real; while government ignores virtually everything about our reef fisheries that is real. If we were in the wheelhouse of my boat with no ladies present I could sum it all up very succinctly in the sailor's vernacular..
Much better to articulate my frustration; I promise we posses only a very sad understanding of our task ahead.